Okay... I'm a fan of Pingu, not from the television series but from an online game that allows the player to control Pingu in a variety of cute and entertaining games. Needless to say, penguins are cool and so is Pingu! However to the matter of the review, this current DVD features everybody's favourite penguin as he attempts to learn the art of sledging and also attempt to create his own pottery masterpieces and what better way than with snow. Pingu is quite a hit in Europe, thanks to a Swiss animation team that has created some wonderful stories and it's finally becoming a hit in Australia and this DVD can be watched by everyone that will bring a smile to even the most staunchest of viewers. 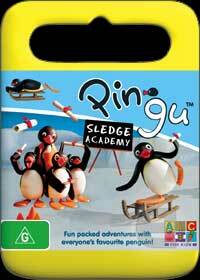 Featuring a cast of many penguins, there's little to complain about Pingu Sledge Academy. Great viewing!